Is this the best day of the year or what?!? I’m posting these annual gift guides a few weeks earlier than normal this year because a) so many of you have asked for them to go up before Thanksgiving and b) I love ya. In fact, I’m posting this game gift guide today, a gift guide for kids tomorrow, and a his + hers + kitchen gift guide on Saturday. Whoop! These gift guides (especially the games edition!) are some of my favorite posts to put together! If this is your first glimpse at one of my gift guides, none of the items I’m waxing poetic about are sponsored. They are just things that our family loves and that we’ve bought ourselves or been gifted from family or friends. Disclaimer: most of the links below are Amazon affiliate links (where I’ve purchased these games), but feel free to shop around for the best deal! Here’s a quick link to all the gift guides I’ve posted over the years. Also, below the post is a list of some of our favorite games of all time (that I’ve posted in the past and are still going strong in our house today). As always, I love knowing YOUR favorite games, too, so leave any fabulous recommendations in the comments! 1. Double Ditto: this super simple (easy to explain) game provided at least 20 hours of entertainment at several family reunions/gatherings this summer. It’s fun to play with older kids , but the most fun was staying up super late playing with the adults. This is one of my favorite group games to play around the table! 2. Scrambled States of America Game: I bought this game on a whim a couple months ago when my kids were going through a geography phase (that actually is eternal and ongoing), and it is a hit! I have to admit I like playing it just as much as the kids. My 6-year old usually needs to be on a team with someone, but the other kids do great (it helps if everyone playing is within a few years of each other’s ages for fair play). 3. Chameleon: another great group game, this was also the hit at my family reunion this summer. My friend, Deb, told me about it earlier this year saying her extended family had played it for hours. Same with us! The quick thinking and inevitable mess ups make it super hilarious and fun. This is definitely a mid-teen and older game (my younger kids have trouble catching on and aren’t as sneaky as they need to be at pretending to know the right clue). 4. Dragonwood: this game was recommended by several of you last year in the game gift guide comment thread, and we love it! This is an oft-played Sunday evening game. It’s clever and strategic and gets the ol’ brain working but easy enough to play for kids about 7+. 5. Pass the Pigs: my grandma always had this game at her house when we were growing up and would visit in the summers. I totally forgot about it until my sister bought a set and I was reminded how quirky and fun and fast and entertaining this game is. It’s a favorite of our whole family. We don’t always follow the exact rules – we go around the table and add up our points based on our pig roll. I love that the whole family can get in on this one. 6. Outfoxed: perfect for those younger game-playing kids, if you are a fan of Hoot Owl Hoot (a huge favorite here), you’ll love this cooperative game that’s great for younger kids, but if you have good-natured teenagers, they actually have a pretty good time playing with their younger sis. 🙂 My sister introduced me to this game; her family of five love it, too. 7. Pit: another childhood favorite, my kids get just as excited (and so dang loud) playing this game as I did growing up. We love it for a good whole family game. All the kids (ages 6 to 14) and of course, me and Brian, get in on the action. Our good friends gifted us this game for a past Christmas, and I’m so glad they did! 8. Kanoodle: this simple, fun, little game would make a great stocking stuffer! Easy to play, I like that it is a single player game – and it’s great for challenging those brain cells (young and old). I often find my kids playing this on Sunday mornings (or when they are avoiding bedtimes). 9. Gravity Maze: I think I mentioned this in a quick post earlier this year about what we were doing to maintain sanity in the summer, and this gravity marble run game was a huge hit. My kids pulled it out (and the roller coaster game below) and played it almost every day. It’s a thinking game…that is super fun, too. Gotta love that! 10. ThinkFun Roller Coaster: like I mentioned above, this roller coaster game and the marble run game made summer days bearable and fun. The premise of both games is pretty similar – there are cards (ranging from easy to difficult) that give clues and then whoever is playing tries to complete the challenge. 11. Solitaire Chess: my kids love to play chess (Brian made them a homemade chess board last year for Christmas with playing pieces put together out of nuts and bolts, and they play it almost every Sunday morning)…but this solitaire version is perfect for those times when they can’t find a willing chess opponent. It’s creative and fun, and I’ve even found myself playing it for a few minutes here and there (my chess skills are rusty and need a little brushing up). 12. Happy Salmon: another fast paced, super easy game, the biggest disclaimer with this game is that it’s loud and chaotic. Needless to say, my kids love it! It is also pretty easy for all ages in our family to play and have fun (even if more often than not, someone gets an elbow to the face when a High 5 goes awry). 13. BrainBox Around the World: I love this game so much! Another geography type game, this one also relies heavily on memory skills. We don’t play it as an official “game” so much as a fun trivia activity (it makes a GREAT car game). 15. Bocce Ball: Brian grew up playing Bocce ball (and lawn darts, although after his brother had to go to the ER twice in a week for a lawn dart gone wrong, I think they got rid of that game)…and this summer we bought a set (bocce ball, not lawn darts, haha) to play as a family. It has been super fun, although some of us are a tad more competitive than others. Ahem. Next Post » Mel’s Holiday Gift Guide: For the Kids! I played a game this past weekend at my brother’s house and thought of you. It is called Relative Insanity by Jeff Foxworthy. It was a super easy game to play and so funny. All of us really enjoyed it and were laughing so hard the whole night. Have you ever played it? I think it could make your game list 2019. Thank you for this list! We added Outfoxed and Kanoodle to our game stash this Christmas. My 5 year old is OBSESSED with the foxes, and it isn’t terribly painful to play as an adult! Adding more of these future birthday lists. Love to hear this, Kelly! Thank you! I just played Shut The Box at my daughter’s house. Was a birthday gift for my 7 year old granddaughter, but it is great for all ages. Won’t bore you with all the details, but it is a good game for learning math skills. The adults loved it and I am planning on buying it for our house. Even fun to play by yourself. Mel, I love your game guides! I check them out every year. Thank you!! One of our enduring favorites, which we learned about from you, I Sleeping Queens. It accommodates a younger non reading sibling. Another good one for younger kids (also from you) is Hoot Hoot Owl. Check out the game Bang!. Our four boys, ages 6-13, and all their cousins, are obsessed. We played it nonstop on our last vacation. It feels complicated at first, but once you get the hang of it, it is so fun. We actually have Bang languishing in our game closet but haven’t played it because bizarrely the instructions are in spanish! Looks like I need to figure it out though because you are the second person to rave about it! I have been going through all your game gift guides to pick out a couple for christmas for our family and for my children who are out on their own. There are so many but i would really like to know your very favorites for adults and older teenagers. Currently we gravitate to things like perpetual commotion, bananagrams, settlers of catan. Since I am not going to get everything you recommend I just want to know the best. Hey Lecia – it’s really hard to choose the ultimate favorites for adults and older teenagers without knowing specific personalities, but if you like settlers of Catan, I bet Carcassone or Splendor would be good choices. Double Ditto and 6Nimmt are great group games as well. I love seeing your game gift guides! I have a few ideas for gifts this year now. Have you ever played Escape room in a Box? I just heard about it and thought I would share with you. It seems to be a big deal! Recommended up there with monopoly. I haven’t tried that one. Thanks! I’m surprised I didn’t see secret hitler on your list. We found it this summer and have played it constantly since our family reunion!! Love your gift guides- but the game guide is our favorite. I just want to know how you find so much time to play games. When do they happen? I feel like I’m always stuck doing dishes when we could be playing an after dinner/before bed game. so I just purchased Codenames, Double Ditto, Catchphrase and Cover Your Assets….we’re starting some new traditions on Christmas now that our older son is in college and has a serious GF…my other 2 boys had input on the games we picked. We think this will make a fun day! Yay, Sally! It’s so fun! Thank you for these great game ideas!!! We love board games and I love hearing new ideas that people like! Recently I discovered that Game Haven (a game store in my town–I’m sure they have stores all over) has a room where you can try out games for free. They also rent out their games and if you rent one and decide to buy it, the rental fee goes towards the price of the game. I remembered Cover Your Assets from one of your posts, so I went ahead and rented it. The first time we played everyone was tired and grumpy and got a bad taste in their mouths for the game. We tried again the next day (and the next) and everyone loved it and begged me to buy it! Thanks for all the suggestions! 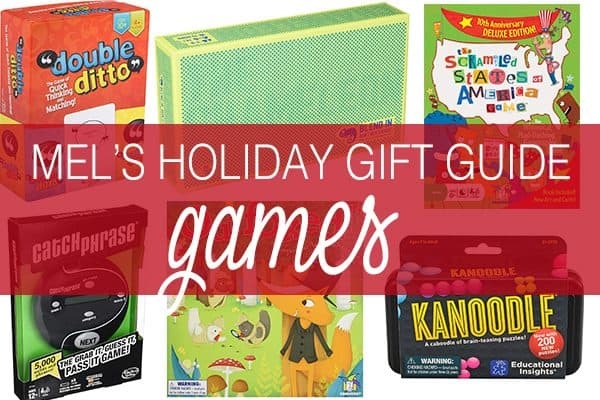 Your gift guide posts are my go to for games and gifts for the kids! I’ve bought quite a few things from your posts and they haven’t disappointed! Thanks for doing these! It’s super helpful as I have boys close to the same age as yours that seem pretty similar in their likes and interests. So, four of my siblings and their spouses went on a Danube River Cruise and just returned home. I packed the games: Pictionary, Quixx, Boggle, Cribbage, cards for Euchre, and Code Names. We had SOOO much fun each night and other cruisers were so jealous of our good times! What an amazing trip! Man, I forget about good ol’ boggle. I love that game! How do you store/organize your games? Do you have any advice on how to not lose/ruin game pieces when you have small babies and toddlers? Keep them in the highest cupboard in the house and only play them during nap time or after bedtime (toddler bedtime, that is). Oh gosh, good questions to both. We have a hall closet that we use 100% for games. It’s kind of a disaster. I try to keep it organized, but it usually is a mess. We’ve lost a lot of game pieces over the years, but one thing I did when I had little kids was to put all the pieces to games in a ziploc bag and tape that bag to the inside of the lid of the game so that it minimized pieces getting scattered everywhere. It wasn’t fool proof – but it did make it so that if a game got opened and overturned, only the board would spill out. Always love and look forward to your gift guides, and get lots of ideas for gifts., and have got lots of ideas for gifts after reading these posts. Have just ordered the Gravity Maze for a Christmas gift for someone. Thanks again. Thank you, Donna! Hope they love that game! I got Outfoxed for my kids last year for Christmas and it’s still one of their favorites! Like Clue, but less macabre. I just ordered Enchanted Forest for them for this year. Love these lists from you! Hope you love Enchanted Forest, Meg – it’s one of the few kid games that I can play over and over. Our family loves to play games and your game guides are the best! We already own and love several of these, but I can’t wait to order a few more for Christmas. Have you guys played kingdom builder, qwirkle, or splendor. Those are some of our favorites for older kids and adults. Labyrinth, enchanted forest, and whoowasit are my favorite for younger kids that I actually enjoy playing too. Mel, I love your game posts! I gave a loud whoop this morning when I saw it. 🙂 I always order several of your recommendations to go under our Christmas tree. Thanks for the great ideas! Always look forward to this post. Thank you!! Thanks for the game guide, Mel! I’ve gotten several from your past recommendations and they’ve all been big hits! I even took the plunge and ordered Battle of the UFOs this year! I wanted to recommend the card game Rat-a-tat Cat. My kids ages 10-4 all love to play that one and I like playing it too. I remember a friend telling me about rat a tat cat a long time ago. I can’t believe I never ordered it to try it out! Glad to know you like it! And I’m SO excited you got the UFO game this year! Seriously, it’s the best. Just to throw this out there, you can play rat a tat tat with face cards, which is basically the same game as rat a tat cat. There are a couple how to play videos on YouTube. It’s a simple game and my 11, 9, and 7 yr olds like playing it. I love your gift guides! I wait anxiously every year. Yes! I wait for these gift guides every year. Thanks for putting them together! Love your gift guides!!! We love Sleeping Queens, Quirkle, Monopoly Junior, Guess Who, and my littler kids love Race to the Treasure. Love hearing what other games you guys love! Love your gift guides. We love Skull Kings….thanks to your recommendation from a past games guide. We also really like Qwirkle, Blockus and Skipbo. Love all of those games, Jill! Glad they are favorites of yours, too. Reminds me we need to pull out Blockus more often. I hope we still have all the pieces! One of my favorite lists each year! Added a bunch to my amazon wish list for Christmas purchases. Thank you! First, What is your favorite teenager game…like for 14 and up? Best game out of Carcassone and Splendor? And third, a suggestion! My teen boys love the card game BANG! It is played at every family reunion or dinner! Have you heard of it? My sister-in-law gave us that game last Christmas! I’ll admit, we haven’t played it a ton, but I think we need to pull it out again and give it another go. Thank you! My kids likes Carcassone more than Splendor but Brian likes Splendor more than Carcassone. How’s that for a muddy answer? And for teenagers, telestrations is probably the favorite…along with 6 Nimmt or Wackee Six (both of those are card games). Code Names is also really fun for that age, too. I just bought Dragonwood and 6 nimmt, thank you! I will try and decide between Carcassone and Splendor. You really should give BANG another chance! It is the game my teens always go for. They spend hours with uncles, aunts, and older cousins playing it. I confess I havent played it because I usually play Sleeping Queens with my younger boys so they have someone to play with 🙂 Also, thanks for your Word on the Street recommendation! It is my favorite! Ok, we are soulmates because Word on the Street is one of my favorites EVER. I love word games. Love ’em. And I just told my kids we are pulling out the BANG game tonight…and they informed me the reason they haven’t played it is because apparently the instructions and cards are in Spanish. Whoops! No wonder! Thank you! You might have been joking a bit about this being the best day ever, but I have bought several things for my husband and kids off your gift guides over the years! It has been super helpful. I was very excited to see this post! I LOVE your game guides! I just bought outfoxed, double ditto, and dragonwood to add to our collection for thanksgiving family fun! Thank you so much for your time in doing this blog, LOVE you and what you share! Is it weird and totally nerdy that I’m so excited for your Thanksgiving now! So excited for you to play those ones, Heidi! We are definitely into games at our house. At the moment, our FAVORITE is Splendor. My five year old can play it yet it’s a strategy game as well so the hubs and I enjoy it. The only downside to it is that it’s only a four player game. But we love love love it. We are also big fans of Dominion. We have the base set and all the add-ons (except for Nocturne because those cards are a little scary for younger players). My favorite add-ons for dominion are seaside, prosperity, and adventures. As far as single player games, thinkfuns rush hour (we have that and rush hour safari) are a huge hit, as well as the iq twist, iq link, iq fit… they are similar to kanoodle. If you aren’t averse to your kids playing with fake guns (think foam guns), the game cash and guns is awesome, and it gets even better with the expansion. Sushi go and sushi go party are both great card games. Set is a card game that the whole family can play. King of Tokyo is a fun. Machi Koro is great and has some fun expansions as well. qbitz and qbitz extreme is a fun puzzle game that even my three year old can participate in (he doesn’t really compete, but he enjoys making the pictures). We also love the cities and knights and seafarers catan expansions. And there’s always ticket to ride (the german one being my favorite version) Sheriff of Nottingham is a fun bluffing game. Fauxcabulary (with add-ons) is HILAROUS. Davinci’s challenge is really fun (although sometimes hard to find). A reverse clue-style game called Kill dr. Lucky is pretty fun too (though I think it’s more fun with more people). Wow, that’s amazing that your 5-year old can play Splendor! It took ME forever to catch on to that game! Splendor and Dominion are HUGE favorites of my aunt and uncle and their kids (also huge game players). Thanks for all the recommendations!! We love the sushi go game as well (and go nuts for donuts – I forgot both of these in this game gift guide darn it!). Love, love your list! Ha ha ha… she doesn’t win often, but she thinks it’s funny to reserve cards and thwart her opponents -she’s a little stinker, that one! But it took me a little while to catch on too – my 9 year old beat me 4 times in a row before I really learned how to play! We love games! I haven’t started thinking about what I want for Christmas but I may have to put a few of these games on the list! If you every need a game for a large group of people (like 22+) you should try 2 rooms and a boom! It works well with 10-22+ people! So many variations of the game! Oh, thanks! Love new game recommendations! I LOVE your gift guides! I look for them every year and have gotten lots of your recommendations Do your kids like the Roller Coaster challenge or the Gravity Maze more? If I got just one which would you suggest. (My boys are 8 and 10 years old). Thanks! Also – I grew up with PIT and Pass the Pigs too! I’ve forgotten about them but they are great classics! Hmmm…both are super fun, but I’d say my kids would pick the roller coaster one just slightly over the gravity maze. Excited to read your gift guides!! When will the post about making thanksgiving food ahead be up? I really looking forward to it!! Hey Heidi! I’m really trying to get that up! I’ve had some tough stuff come up this week medically with my kids (the gift guides were already done and waiting to be posted) and I’m struggling to find the time, but I’m hopeful to get something posted in the next few days. Sorry! Your family definitely takes top priority … praying they get healthy so you can enjoy your time together as a family!! Thanks for understanding, Heidi! I’m still hopeful to get it up. I hate letting you guys down! Yes! I love games! I recently discovered a vintage copy of MasterMind (or Super MasterMind) at my boyfriend’s mom’s house which inspired me to buy it off Amazon (he wanted to find the vintage version – I think it’s from 1976). It’s pretty fun – and I may be a wee bit competitive with it and I’m currently in the lead (having recently guessed his sequence of 5 in only 5 turns!) Another game I really love and have played for many, many hours including an 8-hour train ride in China and countless other times with friends & family, young and old is Monopoly Deal – a fun, easy shortened Monopoly that still allows for the friendly (mostly) competition without stealing hours away of your time – unless you play it 20 times in a row! We have adored your suggestions of Battle of UFOs and Spontuneous and Wits and Wagers- we get a new game for Christmas Eve each year and we now pick only from your lists as the last 3 years were perfect picks! Our fav pics this year for you are ‘Flipside’ – best car game ever for road trips, Bananagrams for family around the table (we love this in teams of 2 for 8 players) and LCR (our friends introduced us to this game at the lake and it is kicked up when everyone plays with a real roll of nickels instead of the tokens provided in the game.) THANKS MEL! Yes! Wits and Wagers is so fun! I’m excited about your recommendations! We have bananagrams and I agree, LOVE IT! But I’ll definitely look into those other ones! Thanks, Rachel! What would be your top selection for a family of 5 with 3 kids ages 10-15? Hey Darcy – Hmmm, lots of games come to mind. For card games, I’d say Cover Your Assets or 6 Nimmt. For other games, Qwixx is super fun for those ages – and so is Pass the Pigs (that one is an ultra simple game, but still really fun). My kids also still really love Apples to Apples (we play that one a lot as a family). Ok, sorry, one more – Rachel reminded me above – I’ve recommended Wits and Wagers in a past gift guide and it would be great for the ages of your family! I always love your gift guides! Do you have a recommendation for a fun game for a 4 year old boy? Sleeping Queens is one of our favorites for younger kids (even a 4 year old can play with a little help). Also Hoot Owl Hoot and Outfoxed would be perfect! Uno Moo and Rat-a-tat cat were two of our favorites,as well as Sleeping Queens and good ol checkers. Can’t forget about checkers! Thanks for the other recommendations, Sheila! Thanks for putting a great list together! My kids love games and I never know where to start on finding good ones. Your recommendations are always dependable! Yay! I’m glad you’re putting these out early! My middle daughter LOVES games and basically feels that she should play several every day! We’ve been enjoying Outfoxed this year, too! My daughters get so many gifts at Christmas from family members that I stash some away for summer! Outfoxed was one of those…there’s nothing like a new game to break up a long summer day!